Warren and Red reach the Invader base and realize just how hopelessly outnumbered they are. Luckily for them, Red’s “backup plan” makes a timely appearance. 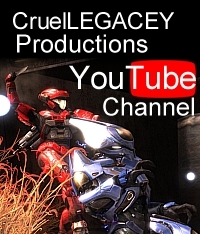 This entry was posted in Episodes, halo reach, Playtime and tagged cruellegacey, machinima, playtime, season 3. Bookmark the permalink. Damn fine work, I have enjoyed the series since the beginning and it just keeps getting better and better. Looking forward to the next episode.